To start off this new era of Your Jerusalem, we have reprinted one of our favorite and most important articles from the “old” Your Jerusalem. The following article originally ran as the headline article in the February, 1999 edition of Your Jerusalem. Has the Jewish Calendar's expectation of Rosh Hodesh shifted? 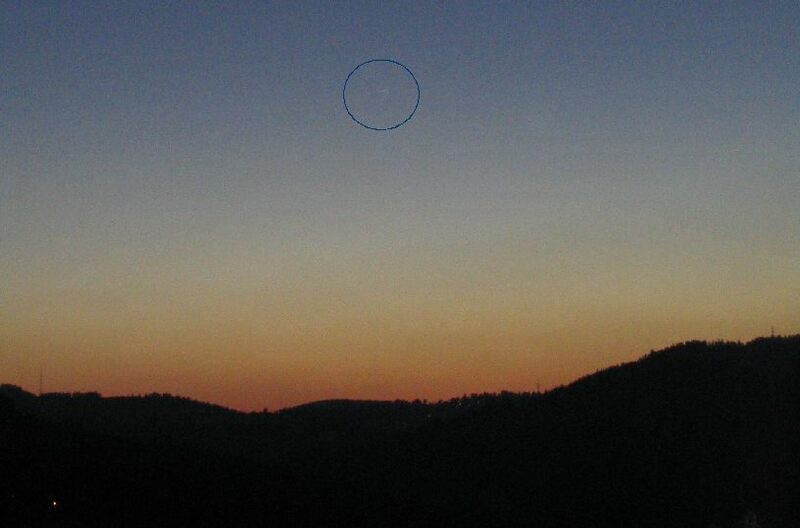 Photo of new moon visible just after sunset. (New moon, difficult to see, is inside circle.) Taken from Ein Karem, Jerusalem. The Jewish calendar, laid out by Hillel II in the year 4119 (358 – 359 C.E.) and in use now for approximately 1,650 years, may have slowly drifted off track according to new research done by leading experts in the field of Biblical Astronomy. The drift is due to small discrepancies between the values of astronomical constants used by the Rabbinical sages and their corresponding values according to the latest NASA data. Compounded over many years, these small discrepancies seem to have resulted in meaningful shifts in the Jewish calendar. The calendar has shifted both in its expectation of the time of the monthly molad, or New Moon, and its expectation of the date and time of the tekufah, or vernal equinox. The first shift means that Rosh Hodesh may fall a day later than the makers of the calendar seem to have intended; the second shift means that the festivals of Pesah, Biqurim (Shavuouth), and Sukkot now fall an average of 13 days later than the makers of the calendar seem to have intended. Rosh Hodesh seems to have shifted, in some cases, to one day later than originally intended by the makers of the Jewish Calendar. This shift is due to a slight discrepancy in the value of the synodic period of the moon as determined by the Rabbinical sages and its corresponding value according to the latest NASA data. The synodic period of the moon, known in layman’s terms as the “month”, is the exact time between one Astronomical New Moon and the next. The Astronomical New Moon occurs when the moon, revolving around the earth, is on exactly the same side of the earth as is the sun. [See Figure 1a] While the length of any given synodic period (month) can vary by up to +/- 0.7 days, the average synodic period, or average month, is constant over a period of many years, and is a crucial value in determining the calendar’s “Rashei Hodesh”, or New Months. The value used by the sages for the average synodic period is 29 days, 12 hours, 44 minutes and 1 “hayleq” (1/18 of a minute or 3 1/3 seconds). Translated into a decimal fraction, this value becomes 29.530594 days. According to the latest NASA data, the average synodic period of the moon is 29.530588 days, a difference of 6 millionths of a day, or translated into seconds, 0.5184 seconds. This means that, according to the value obtained by NASA, each month the Jewish calendar gains approximately an extra half second above and beyond what it should. While half a second per month may seem insignificant, a simple calculation shows that, over time, it is not. If the Jewish calendar gains 0.5184 seconds per month, then each 12-month (regular) year it gains an extra 6.2208 seconds and each 13-month (leap) year it gains an extra 6.7392 seconds. Leap years in the Jewish calendar follow the rule, “7 leap years every 19 years.” Then, another simple calculation shows that in the approximately 1650 years the Jewish calendar has been in use, there have been 608 leap years, while the remaining 1,042 years have been regular 12-month years. Thus over 1,650 years, the Jewish calendar has gained a total of 608 * 6.7392 = 4,097 seconds from leap years and a total of 1,042 * 6.2208 = 6,482 seconds from regular years, for a grand total of 10,579 seconds from both leap and regular years combined. Expressed in hours, 10,579 seconds comes out to be 2.94 hours. The bottom line: the Jewish calendar is about 3 hours later in its expectation of the New Moon. Based on the workings of the current Jewish calendar, this opens the possibility for many Rashei Hodesh to be declared a day late. The process works as follows: In Hillel’s calendar, the average synodic period fixes a monthly point in time which can be called the “Jewish (or Average) Molad”. (The word molad comes from the Hebrew root for birth and means ‘the birth of the new moon’. It is the Jewish Molad of Jerusalem which is announced in synagogues around the world on the Shabbath before every Rosh Hodesh.) Each month’s Jewish Molad is a specific jump in time from the previous month’s Jewish Molad. This jump? You gussed it — the average synodic period of the moon as reckoned by Hillel II: 29 days, 12 hours, 44 minutes and 1 “hayleq” (29.530594 days). Since this jump is a bit large, the calendar is inching forward each month. Rosh Hodesh Tishrei, which in turn sets the Rashei Hodesh for the entire year, is based on the Jewish Molad of Tishrei; Rosh Hodesh Tishrei occurs on the same day as the Jewish Molad of Tishrei unless the Jewish Molad of Tishrei occurs past noon, in which case Rosh Hodesh Tishrei is pushed off by one day. The result of this pushing off by one day is that the rest of the months of the year are also pushed off by one day. (Partial corrections can be achieved by shortening Kislev.) Now we can understand why a three hour lateness in the calendar can make such a difference: more and more Jewish Molads of Tishrei will cross the noon line, and therefore more and more Rashei Hodesh of Tishrei will be pushed off by one day, resulting in the pushing off of the Rashei Hodesh for the entire year. The Festivals seem to have shifted forward by an average of approximately 13 days over 1650 years. The shift is due to a slight discrepancy in the value of the solar year as determined by the sages and its value according to the latest NASA data. The solar year is the exact time that it takes for the earth to make one revolution around the sun. The secular (Gregorian) calendar is based on the solar year, the latest value of which is given by NASA as 365 days, 5 hours, 48 minutes and 45.6 seconds. Hillel II figured it at 365 days and 6 hours, a surplus of 11 minutes, 14.4 seconds. Simple calculation shows that over a period of 1,650 years, this would cause the Jewish calendar to drift forward 12 days, 21 hours, 7 minutes and 12 seconds. The bottom line: the Jewish calendar is an average of 13 days later in its expectation of any given date in the solar year. Karaites, who until this day keep Rosh Hodesh according to actual observation of the moon, celebrate after viewing the crescent new moon. The current Jewish calendar, which is susceptible to drifts such as those described above, stands in strong contrast to the more flexible and self-correcting system, in use before, of fixing New Moons and Festivals based on human observation. In times before the calendar was codified, Rosh Hodesh (the New Month) began when 2 valid Jewish witnesses (ordinary citizens) from the Land of Israel sighted the crescent of the New Moon after it emerged from its position directly in front of the sun. Sighting the New Moon is not as trivial a matter as it may seem at first glance (no pun intended): when the moon is located directly in front of the sun (at the time of the Astronomical New Moon), the dark side of the moon faces the earth and thus the moon is invisible from the earth. 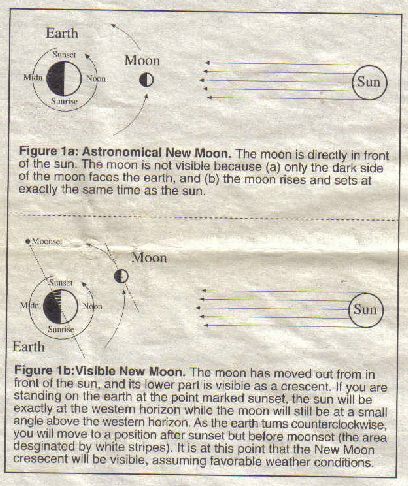 [See Figure 1a] In addition, since the sun and the moon are both at exactly the same direction from the earth, they rise and set at exactly the same time. This means that even if, hypothetically, the dark side of the moon were to be illuminated by some external light source other than the sun, the moon would still be invisible because whenever the moon is in the sky, the bright sun would also be in the sky, outshining the moon. 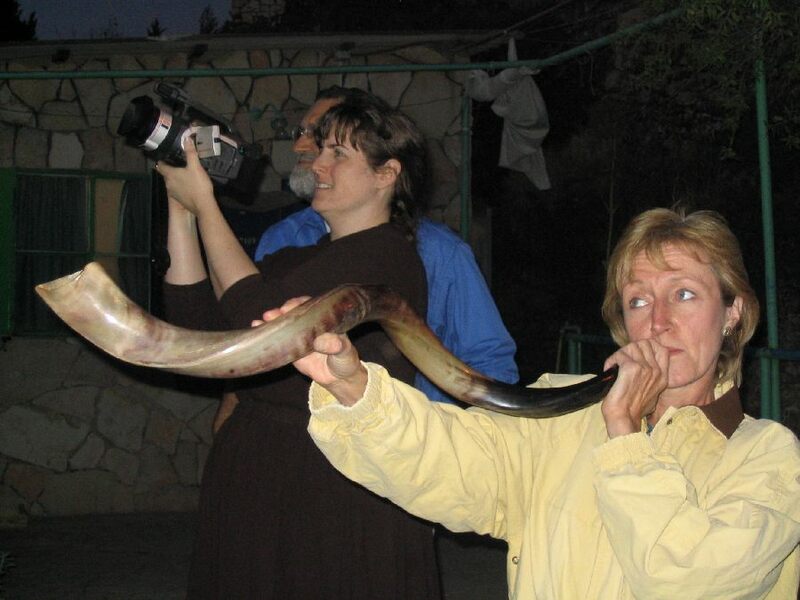 Rosh Hodesh begins when the New Moon emerges from its position in front of the sun. [See Figure 1b] This occurs 1 to 2 days after the Astronomical New Moon, and when it does, the situation has changed only slightly: (1) only a tiny portion of the light side of the moon faces the earth and the New Moon appears as a sliver; (2) the New Moon rises and sets only slightly later than the sun. The bottom line: the only way to view the New Moon is to find its tiny crescent near the western horizon just after the sun sets (when the strong light of the sun no longer makes it impossible to see), and just before the moon sets (only about half an hour later). The observation is therefore difficult due to (1) time limitations (the moon is about to set), (2) position (the moon, about to set, will appear only a tiny angle above the western horizon), and (3) size (the moon is a tiny crescent). The explanation is as follows: (1) Grains, especially barley, which ripen in early Spring in the Land of Israel, had to be ready in time to be brought to the Holy Temple for the Omer [First Fruits] offering on the second day of Pesah. [Leviticus 23:12]. This is because the Omer offering consisted of, among other things, flour made from barley. (2) It was preferable that the fruit trees be ripe in time for Biqurim (Shavuoth) 50 days later, when both another meal offering, “The New Meal Offering”, was brought to the Holy Temple as well as the “First Fruits Basket” [Deuteronomy 26:1]. (3) The previous year could be made leap if the vernal equinox (March 21 or 22 in the current secular calendar) occurred later than the first day of Passover. If it did, then Passover would occur n the Winter, which contradicted the injunction mentioned above that it fall in Spring. It was not enough for one of these signs to be present in order to declare a Leap Year — at least two of them had to be present. If a Leap Year was indeed declared, then the month following the 12th month of the previous year (known now as Adar) became the 13th month of the previous year (Adar II) and not the 1st month of the New Year (now known as Nissan). Then, the month following the 13th month became the first month of the New Year. The old system, before the institution of the calendar, was a flexible and self-correcting system based on human observation of events which would never drift too far from their intended periods. When the Nation of Israel switched over to the fixed calendar, it became tied to numerical constants which, due to minute deviations from actual corresponding astronomical values, have been slowly dragging us “out of sync” over a period of many years. The problem, then, is this: What does a nation, in this case the Nation of Israel, do when the laws it has set for itself begin to take it away from the natural timing and flow of the universe as laid down by God? This is the meaning of the opinions expressed earlier that the Jewish Nation is “out of sync.” Next month we will present to you the work of various individuals and groups who are currently attempting to solve this problem by changing back to the more authentic and more accurate system of celestial and terrestrial observation. Log in | Register |	83 queries. 0.866 seconds.